Lighting a Fire Under Daytona's Creative Community! How does color affect the way you taste your food? Why is simplicity actually a valuable resource? Join our area’s creative community for these fast-paced TED-style talks and many more. Elevate speakers get 20 slides, which automatically advance every 15 seconds, resulting in quick, exciting five-minute presentations. 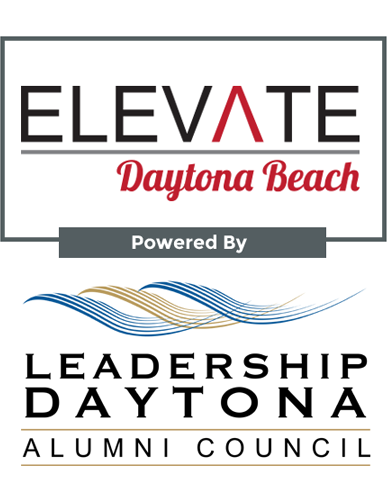 The Daytona Regional Chamber of Commerce’s Leadership Alumni Council is proud to bring to you the Elevate Daytona Beach event as a service to generate high level community discourse. At Elevate, expect to be enlightened and entertained by unique presentations fueled by the speakers’ passions. Elevate Daytona Beach has lined up some of our community’s best and brightest. Seating is limited so get your tickets now. Please get in touch if you'd like to connect with our audience and support our event.